Bob Lucky (25 Jul 2002) & Robert Massey (Nov 2004). Like Peacehaven to the north, Villers-sur-Mer has a number of off-meridian venues such as ‘Garage Central du Méridien’ that incorporate the word Meridian into their name. Although a proposal was made to mark the Meridian in this vicinity with a statue (‘un monument de l’heure’ by the sculptor Leduc), as long ago as 1914, the plans came to nothing. This marking on Avenue De La République is reported as dating from the mid twentieth century. 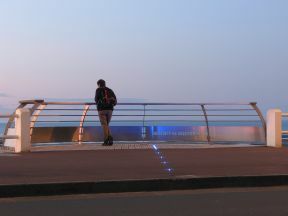 The six pavement studs that were present in 2002 are believed to have been replaced with the five solar powered flashing LEDs in about 2008. They switch themselves on at dusk. In 2016, a further upgrade took place. This involved removing the upper part of the semicircular wall and replacing it with six sections of stainless steel railings surmounted by a curved wooden rail. One section is perforated like a stencil to show where the Meridian runs and carries the words MERIDIEN DE GREENWICH. Another carries the town’s web address. The stainless steel is of inferior quality and showed signs of corrosion after just one year. The paving within the semicircular area was replaced at the same time with some poor quality wooden decking (which shows signs of warping). Inset into it, is a narrow white strip containing LEDs that extends the illuminated section of the line northwards at night. The cost of the 2016 alterations was 8,000 Euros.